Cigar forums are one of the oldest ways for cigar smokers to share ideas, trade cigars, and otherwise engage with one another. It all started back in the 80’s, with something called a BBS (bulletin board system). 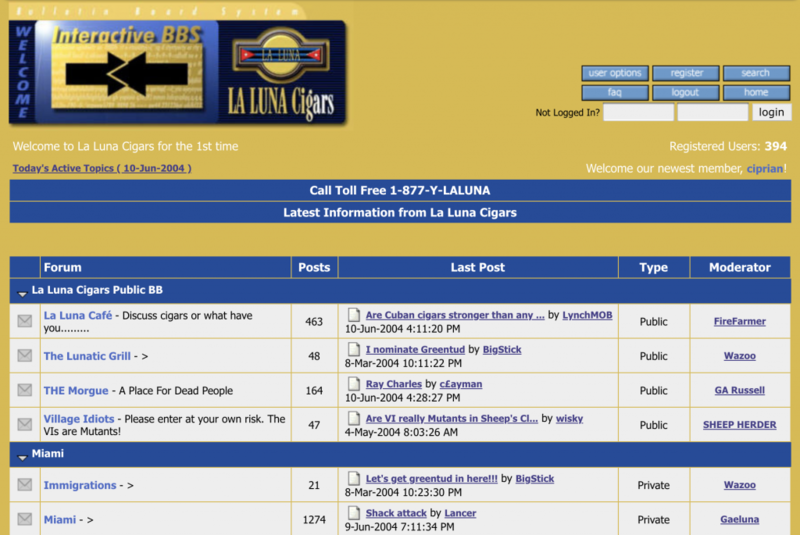 A cigar BBS was very similar to a cigar forum, however consisted of a single PC host and at least one phone line. Cigar smokers would use terminal software to dial into their BBS of choice, and read/respond to messages. They could also share files and pictures. Because BBS’s were on dial up modems, they were extremely slow. Not to mention long distance fees were almost always inevitable! BBS’s don’t even compare to cigar forums today, as the technology back then was so limiting. Over the years with the advent of the internet, online collaboration has evolved dramatically. It wasn’t until the 90’s that online services became mainstream, such as AOL, CompuServe and Prodigy, to name a few. These large online services allowed multiple users to log into their network and converse. Message boards were huge, though very simplistic and limiting. This was the start of online cigar forums. As the internet became more readily available to regular end users, so did websites. 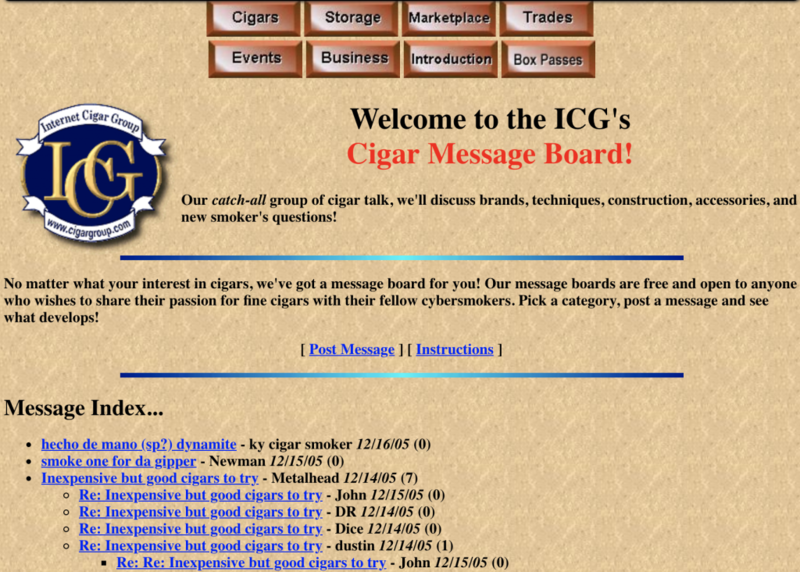 In the mid to late 90’s is when online cigar forums really began to take off. Cigar forums went from basic newsgroups to enhanced platforms with live chat, messaging, photo sharing and more! Cigar newsgroups were the first major platform which resembled a forum. Unfortunately, newsgroups were very limiting, and didn’t offer much beyond basic messages. As time went on, newsgroups began to lose popularity, as website based forums began to take over. One of the original cigar forums in the 90’s was the JRBBS, hosted by JR Cigars. JRBBS was a very popular cigar forum, in which cigar smokers from all around the world would gather, post cigar reviews, share messages and photos, etc. Overtime, the community began to fall apart, primarily due to spam, user disagreements, trolls, etc. This obviously created a lot of tension among the members. It made sense for JR Cigars to get out of the cigar forum “business”, and focus on doing what they do best, selling cigars and keeping their customers happy. JR BBS went offline sometime around 2003. In the late 90’s, more dedicated cigar forums began popping up, including La Luna, CigarWeekly, CigarFamily, Cigar Group, Club Stogie, etc. Each forum had their own unique feel, design and community. Many members were part of different forums, with the understanding that each forum had their own rules and style. Some forums were more moderated than others, whereas others like the CigarPass Forum left moderating to the community of members. In 2000, CigarPass.com launched with an emphasis on creating a cigar forum where members could trade, share and pass cigars in a safe environment. It was not uncommon for other forums to also share cigars and setup “box passes”, however one of the biggest problems was unfortunately there were people who would steal the passes. CigarPass was dedicated to ensuring that rules were in place to dramatically prevent passes from getting “lost” or stolen. Therefore, in order to start, join or participate in a pass, you had to prove yourself within the community. Established members were allowed to vouch for others who may have been new. The same rules apply today, and CigarPass continues to be one of the friendliest and safest online cigar communities around. In 2008, an online media company saw a business opportunity, and thought it would be a good idea to invest in online cigar forums. 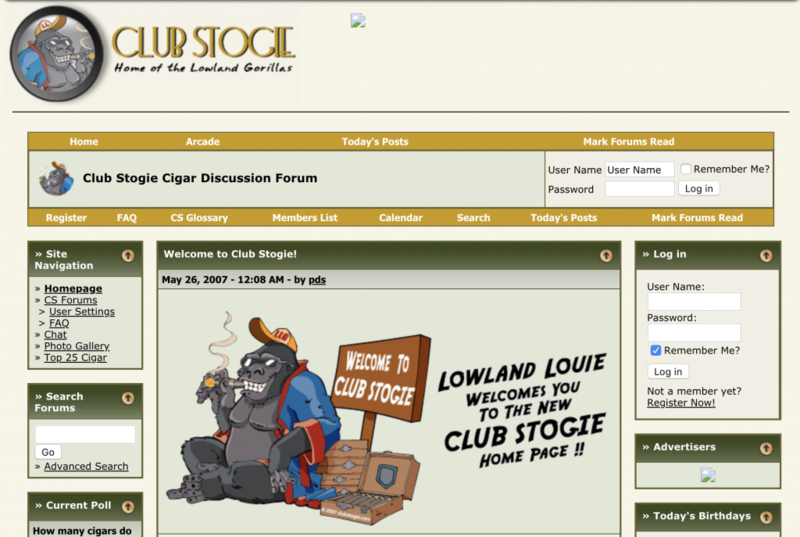 They ended up buying 5 or so cigar forums/sites, including Club Stogie, Top 25, Cigar-Reviews and a few others. They merged them all into one website/forum, and pissed off a lot of members. This spawned users who were part of these communities to either stick it out, or go and create their own community. Puff still runs today, though under new ownership by a Canadian online media company. Allows cigar aficionados to share information, idea’s, and knowledge. If you’re having problems with your cigar humidor, keeping a cigar lit, etc, post a topic in the forum and you’re sure to get plenty of help. Meet other cigar smokers near you. Read cigar reviews, and share reviews of your own. Great for identifying new cigars you want to try. Share pictures of your cigars. Participate in contests for a chance to win cigars. Be part of a group who shares the same interest. Today, few independent cigar forums still exist. Sadly Facebook and other social media sites caused a major disruption around 2009, as users began spending more time on the massive social media sites. Recently, it seems people are finally becoming tired of what Facebook has become, and spending less time there, and more time on truly dedicated special interest websites. This is a brief history of cigar forums, and what the past 20 or so years has looked like. 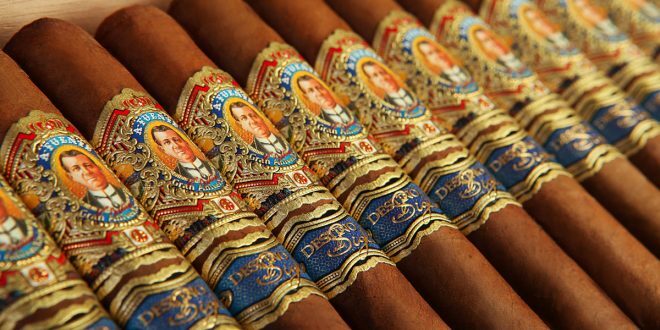 Be sure to check out our cigar forum, and join in the discussion!